- What does the future hold for the management of migration and refugee movement? 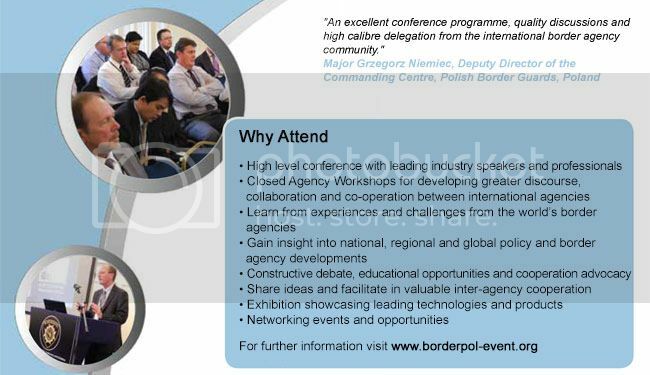 Hosted by Border Force UK, BORDERPOL, the world’s organisation for border management, security and migration management, is delighted to invite you to the 2nd World BORDERPOL Congress on 3rd and 4th December 2013 in London, UK. Register before 3rd October 2013 and save up to 20% on Congress delegate fees. Managing borders in today’s tense geopolitical environment is a complex and challenging task. It is widely agreed that in a globalizing world borders should be as open as possible, yet today governments are understandably more anxious than ever to ensure that their borders are secured against external threats. The World BORDERPOL Congress is a high level 2 day event that will discuss and debate current and future policies, implementation issues and challenges as well as new and developing technologies that contribute towards safe and secure border and migration management. Hosted by agencies and other leading bodies, agencies, industry and commerce will benefit from the opportunity to hear directly from the policy-makers, practitioners and experienced industry players in these series of ‘Open Workshops’, which aim to provide information on the future and potential opportunities available in the market and the challenges facing the industry in these economically challenging times. We invite you to join us and the world border protection, security and management industry, at the Central Hall Westminster on 3rd-4th December, to participate as a delegate in this leading congress with many high profile international speakers sharing experiences, information and case studies, and the opportunity to learn and share information, network and discuss the issues, challenges and solutions with colleagues and peers.